Our Dell category is jam packed full of exciting deals on refurbished Dell computers. 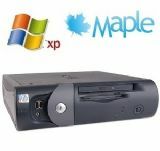 We stock nearly every model of Dell computer made in recent years. Each fully refurbished Dell PC will have undergone a thorough testing procedure and will include a warranty to put your mind at ease. The best bit is the price tag, we offer quality second hand Dell PC's which have been carefully removed from office environments, lovingly restored and refurbished all for a small fraction of the brand new price tag.